The Hotel Monica is a three-star hotel in Pinarella, ideal for families. It has an outdoor pool with jacuzzi, parking, WI-FI, city bikes available, comfortable rooms, entertainment and children's playground area. Animals are welcome. The hotel is located in Pinarella di Cervia in a quiet area. The beach can be reached in a couple of minutes on foot through the pine grove that runs along the coast. The hotel rooms have: air conditioning, WI-FI, minibar, satellite TV and digital terrestrial LCD, telephone, safe and bathroom with shower and hairdryer. The rooms are divided into three types, based on the All Inclusive offer chosen. EMBRACING STAY : attic rooms, smaller than the others. The formula includes, in addition to the listed services: umbrella and 2 sunbeds on the beach, use of beach towel, unlimited drinks with meals. RELAXING STAY : larger rooms, located on the first floor or in the depandace. The services are the same as the Abbraccio formula. COCCOLA STAY : the largest and most comfortable rooms in the hotel. In addition to the services listed, in the All Inclusive formula are available: courtesy set with slippers, coffee bar included, favorite newspaper every morning. Garden, open-air porch, terrace, swimming pool, hydromassage, solarium area with sunbeds, 10 city bikes available, beach towels and newspapers in use. LUNCH AND DINNER : choice of menu, meat, fish and vegetarian dishes, vegetable buffet, cold meats and hors d'oeuvres, homemade desserts and ice cream. Water, wine and pepsi cola at meals. VARIATIONS : vegetarian cuisine, on request for coeliacs. OTHER: once a week the traditional romagnola dinner is offered. In the room : free camping beds for babies. At meals : high chairs, baby food. On the beach : entertainment, playground with elastic net, houses and various games, changing table, bracelets and children's entertainment, live entertainment for children. The hotel has a heated outdoor pool with hydromassage, solarium area with sun loungers and WI-FI areas. 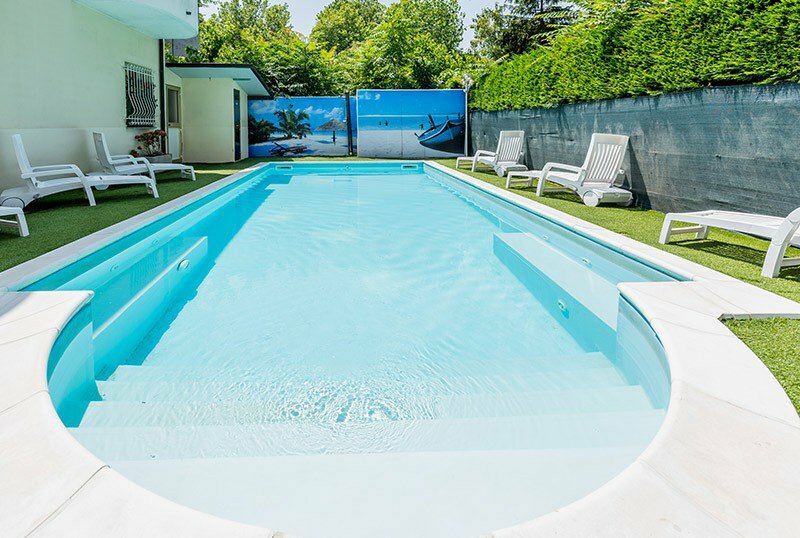 The hotel has an agreement with the nearby Bagno Bruno (63-64), which features: bar, children's playground area, entertainment, sports fields, mats and games storage and much more. In Pinarella the bridges of April 25 and May 1 are a fantastic opportunity to visit our Riviera Choose the best type for you! We will give you the beach service! Easter has returned to Pinarella and is a fantastic opportunity to visit our Riviera, choose the best type for you! The Bridge of 2 June in Pinarella marks the arrival of summer, we are waiting for you for a holiday full of relaxation and pampering! We will give you 1 umbrella and 2 beds + 2 beach towels! Book your holidays now in Pinarella di Cervia for June! Book in advance, choose your favorite room and save!